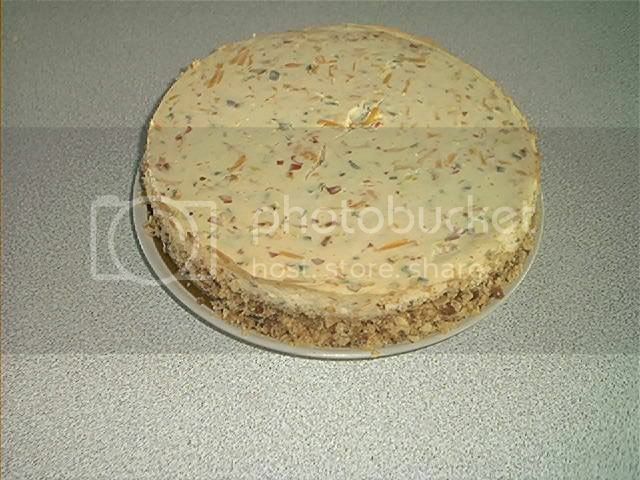 A while ago, Chez, on another forum posted a recipe for ABT cheesecake. The crust is corn chips, bacon, bacon fat and butter (listen to your arteries harden!!) The filling is cream cheese, jalapenos, sour cream, honey and cheddar, and a little shot of Denzels Kamikaze hot sauce for good measure. I used real bacon, not the supermarket stuff, for real, smoky flavour. Jalapenos are from last years crop ... bright red, thin skinned and pretty hot combined with some regular green ones from the store, all roasted and finely chopped. Peter , did you like it. It is a really neat idea for an appetizer isn't it? We do a big party at the cottage on Labour Day and if you enjoyed it, I think that it would be a good thing to add to our food. How did you serve it? Wow Peter - I agree with Tracy, sounds great for Labour Day weekend. How was it? And are you posting the recipe? Sorry, I must have missed these posts somehow. 2 - 3 dashes hot sauce. mix the crust ingredients lightly and press into an 8" springform pan. Refrigerate for 5 min to set up the crust and bake 8 - 10 min in a 325Âº oven, set aside. Beat the cream cheese on low for a minute or 2 till smooth. Add the eggs 1 at a time and continue beating till combined. Gradually fold in the rest, scrape down the sides of the bowl, pour into the pan and smooth the top with a spatula. Set the pan on a large sheet of foil and fold up the sides around the pan. Place the pan in a larger pan and add boiling water till the water is about halfway up the side of the springform pan. Bake in the centre of a 325 oven for 1 - 1 1/4 hours. the cheesecake will still jiggle, be careful not to overcook. Let it cool for a half hour in the pan then chill in the fridge for 4 hours loosely covered. Loosen the cake from the pan with a sharp knife and unmold. Tranfer to a serving plate. Some garnish suggestions: candied jalapenos, carmelized onions, guacamole, pico de gallo, jalapeno jelly. Again, my apologies for missing this post. Good luck all and don't forget to post pics. My family pointed out to me that even though this is a cheesecake, it should be an appetizer or even a main course dish and not a dessert. Cheech wrote: Peter , did you like it. It is a really neat idea for an appetizer isn't it? We do a big party at the cottage on Labour Day and if you enjoyed it, I think that it would be a good thing to add to our food. How did you serve it? Tracy, it really is a different experience in food! It is tasty but kind of hits you in an unexpected way - it's sort of like a quiche in a way, hard to explain but, if you're like me, you gotta try it once. I liked it a lot but some of the others in the house felt that a cheesecake should not be anything other than a pure dessert. I think I made the mistake of serving it too late in the meal. Thanks for the feedback Peter. I will try it out at Labour Day and get back to you on how it went over. Keep posting like this and you shouldn't be left a chicken choker for long. Good luck with it, Tracy. We are expecting pics. I bet these would be excellent as a party finger food if the filling was poured into individual tart shells.